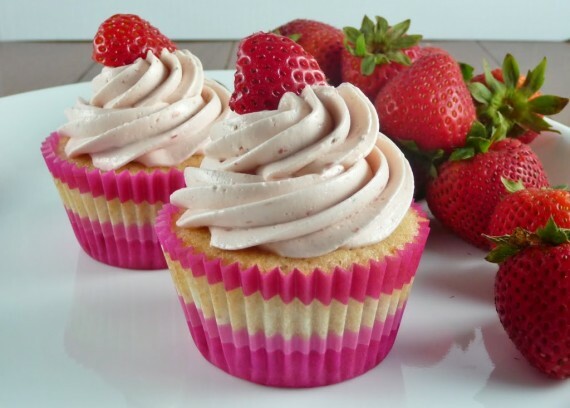 I know I’ve posted a couple different versions of strawberry cupcakes already with Strawberry Cupcakes with Vanilla Cream Cheese Icing and Vanilla Bean Cupcakes with Strawberry Buttercream, but this is the first version that has strawberries in the cake and the frosting. It’s also the first to have Swiss meringue buttercream. This was only the third or fourth time that I’d ever made SMBC because I generally find it to be too rich and not sweet enough. =) Compared to American buttercream, I’d describe it as a little more grown up. I’d never made a strawberry version of SMBC before and I was intrigued by how much strawberry puree went into the icing. I thought it was bound to pack a big strawberry punch, and I was right. The icing tastes like strawberry ice cream. Yum! If you don’t have a stand mixer, don’t even try to make this icing unless your husband, boyfriend, roommate, mom, etc. is there to take turns holding the mixer because by the time you are finished your arm will have “nerve damage” (for those of you who remember the lake trip from ~2003 haha). This frosting does take some patience…don’t give up. It may look curdled or turn soupy when you start adding the butter but keep beating it and just like magic it will all of a sudden be thick and fluffy again. After I added the strawberry puree, I thought there was no way it would get thick, but then voila…it was thick again. Your patience and effort will be rewarded I assure you. Enjoy! 1. To make the cupcakes, preheat the oven to 350˚ F. Line cupcake pans with paper liners. In a medium bowl, combine the all-purpose flour, cake flour, baking powder and salt; whisk to blend. 2. In the bowl of an electric mixer, combine the butter, sugar and vanilla. Beat on medium-high speed until light and fluffy, about 3 minutes. Beat in the eggs one at a time, mixing well after each addition and scraping down the sides of the bowl as needed. With the mixer on low speed, add the flour mixture in two additions alternating with the milk, mixing each addition just until incorporated. Gently fold in the chopped strawberries with a spatula. 3. Divide the batter between the paper liners, filling each about ¾-full. Bake until light golden and a toothpick inserted in the center comes out clean, about 25-28 minutes, rotating the pans halfway through baking. Allow to cool in the pans a few minutes, then transfer to a wire rack to cool completely. 4. 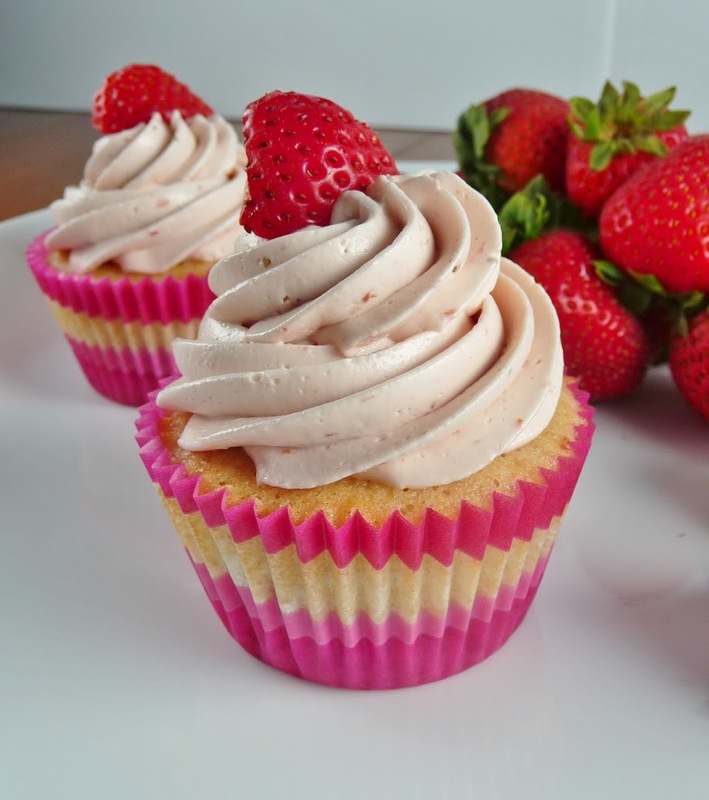 To make the frosting, place the strawberries in a food processor or blender. Puree until completely smooth. Combine the egg whites and sugar salt in a heatproof bowl set over a pot of simmering water. Heat, whisking frequently, until the mixture reaches 160° F and the sugar has dissolved. 6. Reduce the speed to medium and add the butter, 2 tablespoons at a time, adding more once each addition has been incorporated. If the frosting looks soupy or curdled, continue to beat on medium-high speed until thick and smooth again, about 3-5 minutes more (or longer – don’t worry, it will come together!) Blend in the strawberry puree until smooth and completely incorporated, scraping down the sides of the bowl as needed. 7. Frost cooled cupcakes as desired, and garnish with fresh berries or berry slices.